Tate's cold father demands perfection and keeps secrets. But Tate knows his habits well enough to break into his father's at home workshop and he takes a strange device to school with him. Tate only knows that the device shows one of two colors when he scans people but shortly after using it he is on the run from mercenaries. Tate's father is killed in the escape and he has no choice but to turn to his distant mother for help to rescue himself and his girlfriend. Tate learns that the Earth is being taken over by aliens who look just like humans and his father's device is a way to tell who is who. What's more, Tate's girlfriend is an alien and didn't even know it. With humans the minority species on Earth now the remaining human bloodlines don't take kindly to mixing races and Tate and his girlfriend are both in extreme danger from aliens and humans alike. 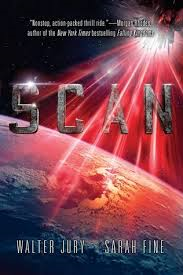 Scan is a fast-paced adventure with lots of bad guys to spare. The human compound was scarily realistic! What the device actually is wasn't entirely clear to me but that didn't really matter to the action of the story.